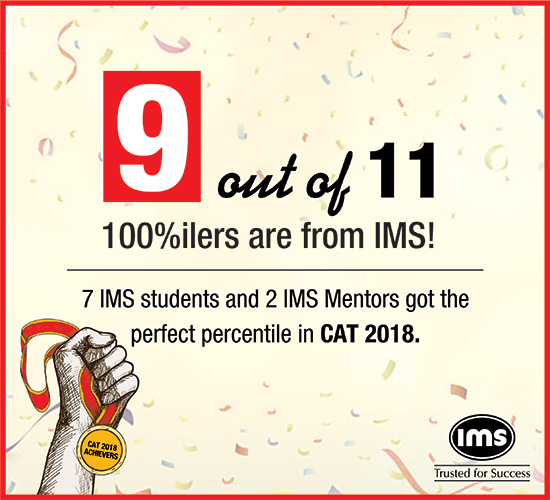 All about CAT 2019: Get the Unfair advantage with IMS CAT Coaching/training programs. Take the simplest route to 100%ile. 250+ hours of modular Offline Classroom teaching with 14 books (BRM basic reference materials). Program flow designed exclusively for Engineers. Fast track program designed for those who need extra focus in weak areas & to develop application & test-taking skills. Program designed for those who are repeat CAT takers, first-time takers who need an effective short duration programme or are self-prepared. A comprehensive distance learning program to prepare for CAT, CMAT, XAT, NMAT, TISS, IIFT, MAT and SNAP; designed for students who cannot attend classes but are self-disciplined and motivated. A comprehensive test series for CAT and other MBA entrance tests most suitable for test takers offering: 40 SimCATs, Concept as well as Application level questions, Sectional tests with ADDITIONAL 15 eMaximiser-Online video workshops and get The C.A.T Approach - Completely Online! A comprehensive test series for CAT and other MBA entrance tests most suitable for test takers offering: 40 SimCATs, Application level questions, Sectional tests and more! Additional preparation that is needed to crack tests like the XAT, IIFT, NMAT, SNAP, TISS, MICAT, CET, CMAT, MAT, GMAT, PGDBA (IIMC+ISI+IITK).